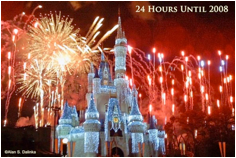 Home › ASDHollywood › Articles & Essays › What Are You Doing at Disney World on New Year’s Eve? What Are You Doing at Disney World on New Year’s Eve? A “free” hat from Walt Disney World on my balcony at Disney’s BoardWalk Villas. The Busiest Days and Nights of the Year. Certainly my answer to this question has become more refined over the course of the nine years that I have become a veteran of the New Year’s Solo Trip to Walt Disney World. Contained within my answer is advice (or, at least, lessons learned) that can help just about any visitor to Walt Disney World. I have been a Disney Vacation Club (“DVC”) member since February 2000. Thanks, at least in part, to DVC member discounts, I have been a Walt Disney World Annual Park-Hopper Passholder for many of the years since then, including at the time of writing (though, ironically, not at the time of posting due to Disney making my last renewal 15-months). I have a sufficient number of DVC ownership “Points” at both Disney’s BoardWalk and Disney’s Beach Club such that, eleven months in advance, I can make a reservation to stay in each resort every other year for more than a week in a one-bedroom villa starting just before each New Year and ending in January. Both resorts are just short walk away from Epcot’s International Gateway entrance (also known as Epcot’s “backdoor”). You can also take a longer walk from these resorts to (what is now called) Disney’s Hollywood Studios (the “Studios”). Disney also operates boats called Friendships that travel from the International Gateway to BoardWalk, then the lighthouse serving Disney’s Yacht & Beach Clubs, then Walt Disney World Swan & Dolphin, and then Studios. Boats also operate that same course in the opposite direction. All told, it takes about 30 minutes to ride the boat from the International Gateway to the Studios. For most folks, including fairly slow-walking folks like me, walking between destinations is faster. Of course, pacing yourself at Walt Disney World is critical and taking the boats can give you that needed break. Isn’t it so crowded that you have to wait in lines forever? If you like waiting in lines, you certainly can on New Year’s Eve, but you don’t have to do that. Indeed, if there are certain rides that you MUST ride on New Year’s Eve, you will probably have no choice but to spend a sizable part of your day in line. Based on three- and four-hour Stand-by posted wait times I have seen, I have to assume there are people that do this. I don’t. 3-hour Stand-by wait & No FastPasses left. Since you are reading an article at a “fan site” about Disney Parks, you probably are already familiar with Disney’s FastPass Service where you get that little slip of paper just outside some of the most popular rides that “virtually” waits in line for you. On New Year’s Eve, unless you are a rather early riser, FastPass is not the solution. For the early risers, the question is do you have the stamina to last the whole day for those midnight fireworks? 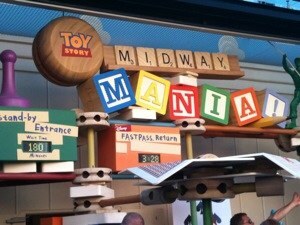 Or even to wait for your FastPass ride time? On what seemed like non-crowded days in April, I have picked up a FastPass ticket for Soarin’ at 11 a.m. and received an 8 p.m. return time! In any event, when Disney Parks are crowded – on New Year’s Eve, they sometimes set records – the FastPass tickets will run out, perhaps well-before noon on days where the park is open past Midnight. 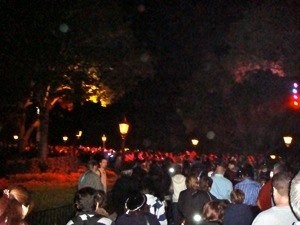 Thousands head for the exits at Epcot after the fireworks end just past midnight. Park choice is also an issue when answering this question. I do not even consider visiting Disney’s Animal Kingdom on New Year’s Eve, as the park closes before midnight and, of course, has no animal-scaring fireworks. I suppose you could visit for a few hours, but no matter what resort you stay at, that requires a bus ride or a drive – and I do not want to be dependent on traffic and busses to get to a resort to see fireworks at midnight. I have never dared to venture into The Magic Kingdom on December 31 either. Even with that park’s capacity rumored to be around 100,000, I have yet to join the revelers there. I hear regular reports of the park being “closed” to additional admissions on New Year’s Eve. The key point of dissuasion for trying to visit this park when it is at capacity: transportation. Remember, unless you are staying at Disney’s Contemporary (or the new DVC Bay Lake Tower) that allows you to walk, the only ways to get to and from the park are boat, bus or monorail. When I think of 100,000 folks heading to the exit at about the same time, it makes me glad to be within easy walk of Epcot’s backdoor. Even an iPhone can take a great picture of Fantasy in the Sky. Further assisting me in deciding to skip The Magic Kingdom on New Year’s Eve is that on December 30, for many years now, they show the same 360º “Fantasy in the Sky” fireworks show (including the countdown to midnight) as they do the next night. They also regularly have the three “Extra Magic Hours” for Disney Resort guests scheduled for December 30, allowing you to stay in the park until 3 or 4 a.m. (depending on the day of the week), as I have done many times over the years. In the last hour or two before the final park close those nights, there is usually little to no wait for popular rides, even Space Mountain! 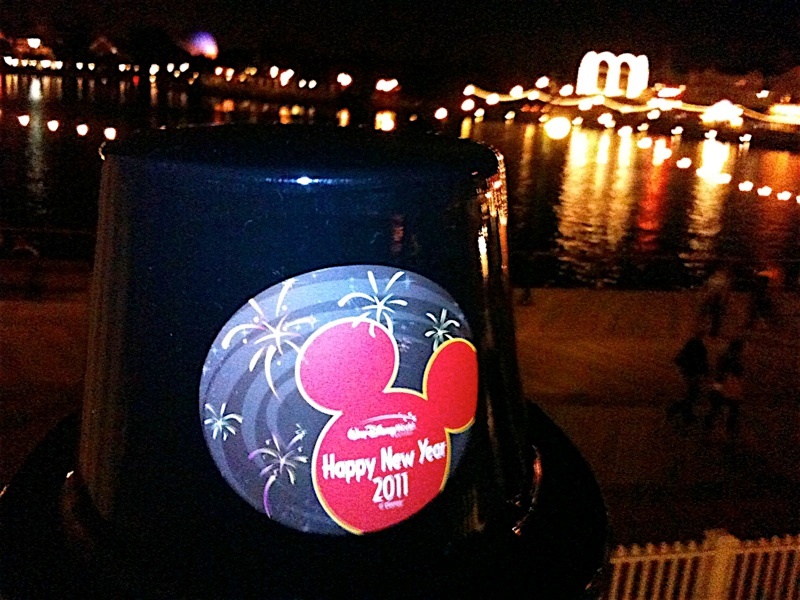 I watch the 7:30 Illuminations from BoardWalk on New Year’s Eve. Thus, and, perhaps, obviously, my parks of choice for New Year’s Eve are Epcot and the Studios, as they are both within walking distance of my DVC Home Resorts of BoardWalk and Beach Club. While I have heard of the Studios reaching capacity at various times, I have never been turned away from Epcot’s International Gateway after returning to my room for a dinner break. Just as importantly, both parks are also ideal for the number of attractions they have that are what I call “People Eaters.” Traditionally, folks that write about theme and amusement parks talk about People Eaters in terms of riders per hour – Haunted Mansion and Pirates of the Caribbean being the oft-cited kings. But since those rides still board just a few folks at a time, I like to think of People Eaters as how many can experience this attraction at the same time? The attractions below each host hundreds at a time (the items marked with * host more than 1000 at a time). Lights! Motors! Action! at the same time! A final consideration of note is that Epcot has the most real estate that is open to pedestrian traffic. Sure, Animal Kingdom is the largest theme park Disney has built to date, but its pathways are narrow and highly-themed to nature. Magic Kingdom’s pathways are bigger than Disneyland’s, but there are still numerous choke-points. The Studios is the smallest park and while it has a few wide “streets,” it can get very crowded. Epcot’s pathways are all broad (except for a single choke-point in front of the Mexico Pavilion). There are numerous places to breathe in Future World and along the entire World Showcase promenade. You can even be fairly isolated from the hubbub of the New Year’s Eve crowd for a few moments if you are looking for that sort of thing. On New Year’s Eve, they even open backstage paths to help with crowd flow from the World Showcase toward the main exit. 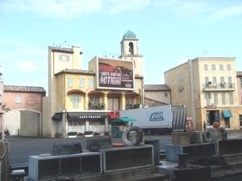 If you’ve never been backstage, it’s an interesting unthemed look at Epcot. In any event, you do not have to spend New Year’s Eve waiting in lines and can still get a full day’s entertainment in Epcot and the Studios. Indeed, at both parks, it is even possible to select a prime New Year’s Eve fireworks viewing location only an hour or so before midnight, especially for the solo traveler. ‹ What Are You Doing New Year’s Eve?